Dell EMC InfoArchive transforms the way companies manage all types of data by eliminating information silos and unlocking data trapped in legacy and critical applications. InfoArchive reduces costs by decommissioning obsolete applications, optimizes active applications and exposes insightful data to knowledge-workers and analytics technologies – while consistently ensuring compliance with regulatory mandates. Watch this EMC Webcast and learn how to enhance compliance by establishing an application decommissioning factory. 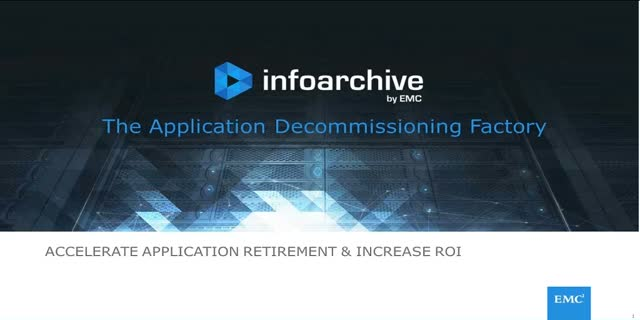 You've achieved success with your first app decommissioning project with InfoArchive. The projected savings from the project will help to fund new initiatives. What if you could replicate those successes to drive more benefits from your investments on InfoArchive and your team? This session will describe proven approaches where your project experience can be used to scale the benefits of application decommissioning that will drive further savings and opportunities to reuse your application data in new ways. Watch and learn how EMC InfoArchive is helping companies meet the challenge of ensuring compliance by providing a true enterprise archiving platform.